It is coming down to the last few days of school and my kids are so excited for summer vacation to start! They can’t wait to sleep in, play video games all day, and never do homework again… yeah right! All I can think is, “What am I going to do with these cute kids all day, every day, for 3 months? !” I don’t want them climbing the walls, bored, or wasting time on electronic devices. How can I be the “fun” mom and still stay sane? For me, summer is a great time to reconnect with my kids – I really love it! But I know that I need some degree of routine and organization. At the beginning of each summer, I sit down with the kids and create a bucket list of fun things we would like to do during their time off. It always starts with grandiose ideas like Disneyland or going on a cruise but ends up filled with more realistic adventures like going to the library, going on a bike ride, hiking, doing a secret service, baking, crafting, visiting local monuments, going to a movie, or going bowling. Together we also make a list of daily tasks we have to get done in order to do the fun things on our calendar. For the little kids it is as simple as getting dressed, making their bed, getting breakfast, and cleaning up their toys. For the older ones, it may be emptying the dishwasher, folding a batch of clothes, or mowing the lawn. The rule is that we don’t get to go anywhere until the our daily tasks are done. My kids learn really quickly that if they take until 1 or 2 p.m. each day to do their daily tasks, that doesn’t leave a lot of time for fun. Having a few tricks up your sleeve could be a life saver! Maybe your plans for the day are botched by a tired kid or car trouble. Have a few back up plans like a new little blow up pool, a new game, new sidewalk chalk or a new DVD. Stock the pantry and fridge with grab and go snacks like trail mix, granola bars, and beef jerky. The garage freezer always has a bin of cold treats too like popsicles and gogurts. I finally got smart and tied a pair of scissors to the freezer handle for opening packages and a garbage next to it for trash. Hungry kids are cranky kids and since they are doing a lot more running around, they are a lot more hungry! Sometimes things just don’t go as planned, so be prepared to be flexible! The only thing you can control is your attitude! So it rains on the day you were going to go to the pool….stay inside and have pajama day! Be prepared for little mishaps…nothing ruins a fun day at the park like a crying child who just needs a bandaid! 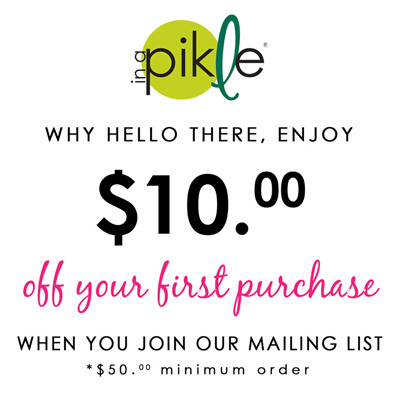 Make sure you have an “In A Pikle” bag for life’s little emergencies! This little bag is perfect for a purse or glovebox and can be purchased with convenience items such as bandaids, tissues, mini scissors, hand sanitizer, tweezers, and hair bands! It is a must have items for your summer fun! Over time, I have also learned the KISS principle…it stands for ”Keep it simple, sweetie!” Everyday does not need to be spectacular. Kids have fun doing the simplest things and mostly they just want to spend time with you! This entry was posted in In A Pikle and tagged activities, bucket list, calendar, entertainment, kids, Summer.